The study involved four major activities in estimating the current market size for cable testing and certification. Exhaustive secondary research was done to collect information on the service market and the parent market. The next step was to validate these findings, assumptions, and sizing with industry experts across the value chain through primary research. Both top-down and bottom-up approaches were employed to estimate the overall market size. Thereafter, market breakdown and data triangulation were used to estimate the market size of segments and subsegments. In the secondary research process, various secondary sources such as Hoovers, Bloomberg BusinessWeek, and Dun & Bradstreet have been referred to, so as to identify and collect information for this study. These secondary sources included annual reports, press releases & investor presentations of companies; white papers; certified publications; articles by recognized authors; gold standard & silver standard websites; food safety organizations; regulatory bodies; trade directories; and databases. The cable testing and certification market comprises several stakeholders such as raw material suppliers, processors, end-product manufacturers, and regulatory organizations in the supply chain. The demand side of this market is characterized by the development of the food & beverage, pharmaceutical, nutraceutical & dietary supplement, personal care, and feed industries and the growth in population. The supply side is characterized by advancements in technology and diverse application industries. Various primary sources from both, the supply and demand sides of the market were interviewed to obtain qualitative and quantitative information. The supply chain of the industry and market size, in terms of value, were determined through primary and secondary research. All possible parameters that affect the markets covered in this research study were accounted for, viewed in extensive detail, verified through primary research, and analyzed to obtain the final quantitative and qualitative data. The research includes the study of reports, reviews, and newsletters of key industry players along with extensive interviews with key officials, such as directors and marketing executives. After arriving at the total market size through the estimation process explained above, the overall market was split into several segments and subsegments. The data triangulation and market breakdown procedures were employed, wherever applicable, to complete the overall market size estimation process and arrive at the exact statistics for all segments and subsegments. The data was triangulated by studying various factors and trends from both the demand and supply sides. In addition, the market size was validated by using both top-down and bottom-up approaches. Then, it was verified through primary interviews. Hence, for every data segment, there are three sources—top-down approach, bottom-up approach, and expert interviews. The data was assumed to be correct when the values arrived at from the three sources matched. DEKRA (Germany), Underwriters Laboratories (US), British Approvals Service for Cables (UK), SGS (Switzerland), and BRE Global (UK) among the total 22 major players covered. This research report categorizes the global cable testing and certification market on the basis of end user, type and region. 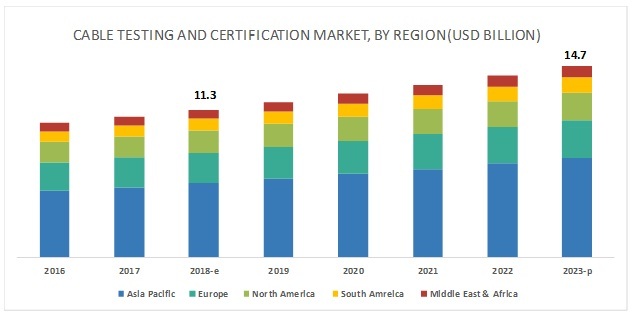 The market for cable testing and certification is projected to grow from USD 11.3 billion in 2018 to USD 14.7 billion by 2023, at a compound annual growth rate (CAGR) of 5.4% during the forecast period. Cable testing and certification are widely used to verify the cable’s safety and efficiency. The growth of the cable testing and certification market is, therefore, directly associated with the growing demand for cables in the electrical & electronics, transportation, and energy generation & distribution applications. The low-voltage cable testing and certification segment is projected to be the second-fastest-growing market during the forecast period. According to the IEC, cables considered under the low-voltage segment have a voltage below 1 kV. These cables are used as an essential component in the secondary distribution of electricity. Low-voltage cables account for the largest share in the overall cables market due to their wide range of applications such as commercial, industrial, and utility. Testing of these cables is mainly dependent on its raw materials and applications. The price of testing low-voltage cables is lesser than the price of testing the medium- and high-voltage cables. The growth of this segment is associated with an increase in industrial automation and infrastructural developments in various regions. Sample test to remain the second-largest segment of the cable testing and certification market during the forecast period. A sample test is a group of tests performed on the samples of finished cables at a specified frequency, to verify whether the cables produced meet the specified requirements. The frequency of testing may range from one month and above. This test is performed to check the quality of cables produced in the same plant in different batches and at a different time. The tests performed under this segment are mainly used to check the material of the cables. Some important tests conducted under this segment are ageing in air bomb, ageing in air oven, bending, crush testing, fiber content analysis, flexing, high voltage (water immersion) test, hot set, oil resistance, tear resistance, tensile strength and elongation at break, and water abortion test (for insulation). The demand for these tests is expected to increase with the increase in import and export of high-quality cables across the globe during the forecast period. 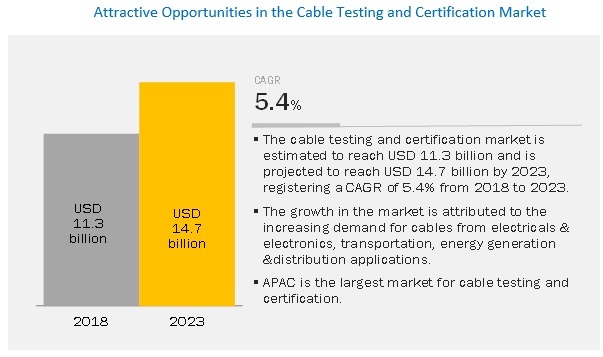 APAC is estimated to dominate the overall cable testing and certification market, in 2018. The region has emerged as the largest consumer of cable testing and certification, owing to the growth in production and consumption of cables in countries such as China, Japan, India, South Korea, and Australia. The growing industrialization in these countries is expected to drive the market for cable testing and certification in the region during the forecast period. Some of the leading players of the cable testing and certification market are DEKRA (Germany), Underwriters Laboratories (US), British Approvals Service for Cables (UK), SGS (Switzerland), BRE Global (UK), TÜV Rheinland (Germany), Bureau Veritas (France), Intertek (UK), TÜV NORD GROUP (Germany), North Central Electric (US), RN Electronics (UK), TÜV SÜD (Germany), Eland Cables (UK), and Industrial Tests (US). In September 2018, TÜV Rheinland (Germany) and Shenzhen No. 3 Vocational School of Technology (China) signed a strategic cooperation framework agreement to build Sino-German Industry 4.0 Demonstration and Training Center. The center will benefit the development, upgrading, and transformation of Shenzhen’s industry, and support the 'Made in China 2025’ strategy. With this agreement, TÜV Rheinland is expected to increase its presence in China. In June 2018, Underwriters Laboratories (US) and TISI (Thailand) signed a memorandum of understanding (MOU) to promote national safety standards for Thailand. TISI is the national standards organization for Thailand. Under this MOU, both the companies will exchange their standards information, cooperate and collaborate on safety-related standards issues, and TISI will participate in UL Standards Technical Panels. In December 2017, Underwriters Laboratories (US) wire and cable division signed a Memorandum of Agreement (MOA) with Korea Testing Certification (KTC), a leading testing and certification service provider in South Korea. Under this MOA, KTC will establish a laboratory in Gokseong, South Korea, by 2020 to provide testing services based on UL standards and UL will support KTC in determining facility specifications and provide training to the KTC staff on the UL standards. What are the global trends in the demand for cable testing and certification? Will the market witness an increase or decline in demand in the coming years? What is the estimated demand for testing and certification of the different voltage types of cables? What were the revenue pockets for the cable testing and certification market in 2017? What are the different cable certifications for environmental needs? Who are the major cable testing and certification service providers globally?